Today we are continuing our Homemade Halloween series. This strongman suit complete with tattoos is really easy to make. This strongman was impressing everyone with his amazing feats. Find full instructions below and click here for our whole series. 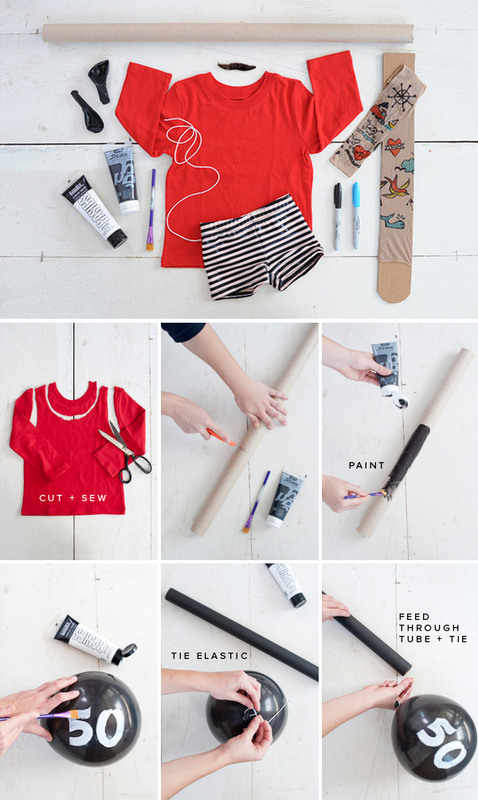 Materials Needed: Red Tshirt, Wrapping Paper Cardboard Roll, Two Black Balloons, Elastic, Nylons, Sharpies, Moustache, and some stripey shorts (we got ours at American Apparel), black and white paint. Step 1: For the tank top we modified a red tshirt to create a low cut tank top. You’ll need basic sewing skills for this. Step 2: To make the barbells cut the wrapping paper roll to the right size and paint black. Blow up the balloons and paint numbers on them. Tie Elastic to one balloon and thread through the tube, then tie to other balloon so they are held tight by the elastic. Step 3: Stretch out nylons over a piece of cardboard and draw tattoos all over, sew the pieces onto the red tank top. this is THE BEST ONE so far. i keep saying that with each costume you post but it just can’t be helped. CUTE!!! I love how you used the balloons for the weights! We recently did something along these lines–a vintage circus photobooth (got the whole family involved) and it was a blast!! 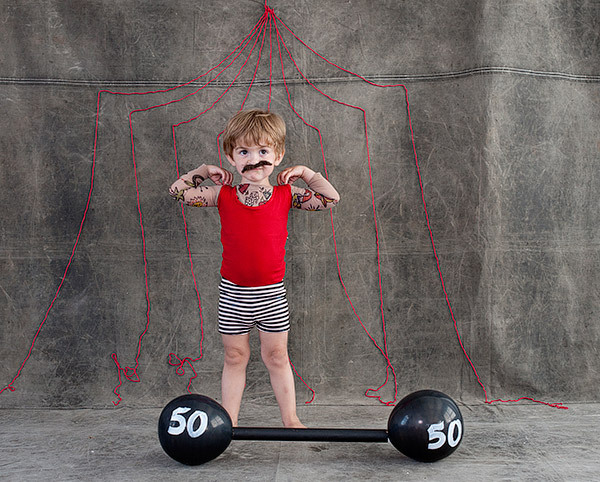 There is nothing more adorable than a toddler wearing a mustache! Great idea for a costume! Clever! Adorable! I love the idea or creating your own tattoo sleeves with nylons & markers! I love this! What a sweet idea, and Roman looks great! I grew up in New Brunswick, Canada and we had the same problem as Janis in Manitoba. It often snowed on Halloween so you had to stay warm. I think you could still make it work though. That is the cutest costume ever!! I wish i could be a strongman now! This is adorable! How funny. this is tooo adorable! my favorite so far!! haha i love the moustache! he’s workin it! So stinkin cute! Great idea. Another great one! I made my three month old son go as “The Strongest Baby in the World” a few years ago by carrying him in the wrap face-forward and having him hold a barbell I made from foam balls and a dowel. 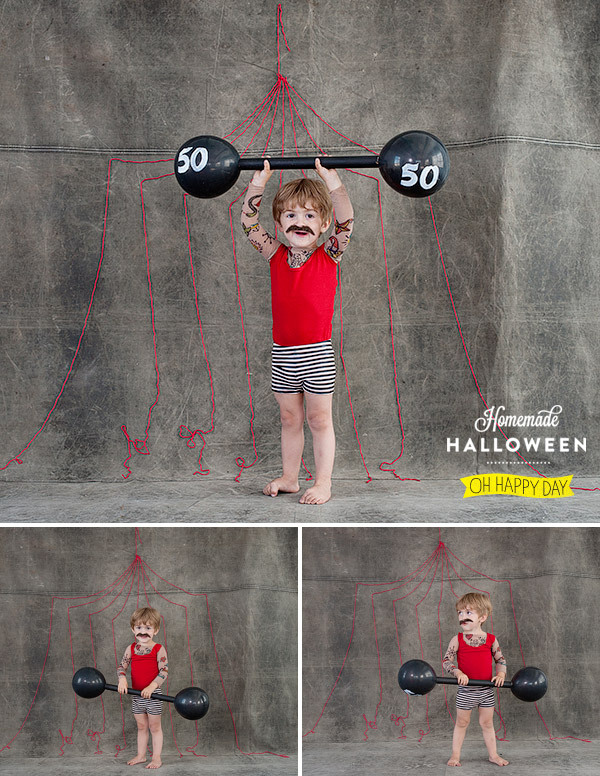 He was a huge hit, even better the next year when I could draw a mustache on him to got with the barbells. The tattooed arms are super clever. Keep them coming! This is beyond cute! Another great costume… I wonder… any thoughts on sharing ideas for asult costumes? How cute is he in that little mustache! I so want my two year old to be this! I might have to make him some tattooed legs though, because in New England there’s no telling what the weather will bring on Halloween! I LOVE this. If I had a little boy I would definitely do this. Easy and fun. This is so funny. The look on the kid’s face in the last picture is hilarious. for new blog owners please share. I understand this is off subject however I just had to ask.